All Alex Yow wants is to become a photo-journalist and break her first story. All Brandon Yow wants is for his sister to keep out of trouble and come home. But that’s not going to happen, because Alex has taken a picture of a statue. A statue that can move. A statue that makes people disappear. A statue that is hunting them down. In upstate New York, the Doctor is chasing weird energies that should not exist. Teaming up with Alex and Brandon, he discovers a powerful force enslaved to another’s will. Who controls the lonely assassin that prowls the streets? What secrets are the residents of Rickman hiding? And will Alex and Brandon survive the night of the Weeping Angels…? 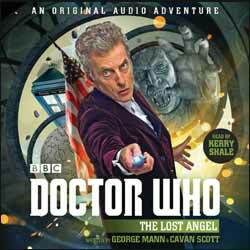 This is the first of four linked exclusive-to-audio books by George Mann and Cavan Scott, all of which have “The Lost…” at the start of the title. The lost thing in this instance is a Weeping Angel, marking the return of one of the Doctor’s most dreaded foes. Mann and Scott convey the threat of this creature surprisingly well on audio – which is remarkable when you consider that on television the Weeping Angels are usually an entirely visual and silent menace. There are unsettling descriptions of flickering electric lights, creating a strobe effect and foreshadowing the movement of the Angel. The writers also effectively present the monster’s point of view, and depict its ability to reproduce and manifest itself via a static image on a screen – a property we haven’t seen since The Time of Angels. George Mann appears to be on a mission to create additional companions for the Twelfth Doctor to populate the gap between the departure of Clara Oswald and the arrival of Bill Potts. For Titan Comics, he created the punk bass guitarist Hattie in The Twist. Here, Mann and Scott introduce us to an American brother and sister duo, Brandon and Alex Yow. He is protective, in a Ben Jackson or Jamie McCrimmon kind of way, whereas she is dauntlessly independent, à la Polly Wright or Sarah Jane Smith. Given the American setting and characters, it is entirely appropriate that this audio adventure should be read by a North American, the Canadian Kerry Shale. The back-cover blurb reminds us that he played Dr Renfrew in the Eleventh Doctor episode Day of the Moon, though I think of him primarily as a voice artist, having first encountered him narrating X-Files audio books. As expected, Shale gives a compelling performance, though his Twelfth Doctor sounds more like a cross between Craig Ferguson and Shrek than Peter Capaldi. The story takes a while to get going, but I’ve always got time for Angels.